Indonesia's manufacturing activity continued to expand in June 2018 albeit at a lower level compared to the preceding month. The Nikkei Indonesia Manufacturing Purchasing Managers' Index (PMI) declined from a reading of 51.7 in May to 50.3 in June (slightly above the 50.0 level that separates expansion from contraction in the manufacturing sector). Slower rises in both output and new orders were key reasons that explain the month-on-month decline. Although Indonesia's manufacturing expansion streak rose to five months in June 2018, the country's manufacturing sector did expand at the weakest rate of the past five months. Both the rate of expansion in output and new orders was only marginal last month. Meanwhile, new export business decreased for the seventh successive month. According to the survey, Bank Indonesia's recent interest rate hikes (raising the nation's benchmark interest rate from 4.25 percent to 4.75 percent in May 2018) have disrupted economic activity (including consumption) in Southeast Asia's largest economy. Considering the central bank, again, raised the benchmark rate (by 50 basis points) to 5.25 percent in June, the domestic manufacturing sector will need to face more challenges in the period ahead. The modest growth in output and new orders encouraged local manufacturing companies to expand their purchasing activity. Thus, input buying rose (as it has in each of the past five months), but the latest rise was the weakest since March 2018. Moreover, the increase in purchasing was not sufficient to prevent a reduction in stocks of inputs (it was the first this occurred in the past three months). Stocks of finished goods also decreased. Amid easing inflation in Indonesia output prices rose at a slower pace. Where charges increased, panellists linked this to the passing on of higher input costs to customers. Meanwhile, input prices continued to increase in June (albeit at the weakest since the start of 2018) due to rupiah weakness versus the US dollar. Business confidence among Indonesian manufacturers fell to the lowest since October 2012 despite their expectations that output will rise over the coming year. Meanwhile, employment in the manufacturing sector rose for first time in three months as manufacturers responded to higher output requirements by taking on additional workers. The higher staffing level and relatively weak growth of new business meant that manufacturing companies were able to work through outstanding business again in June. 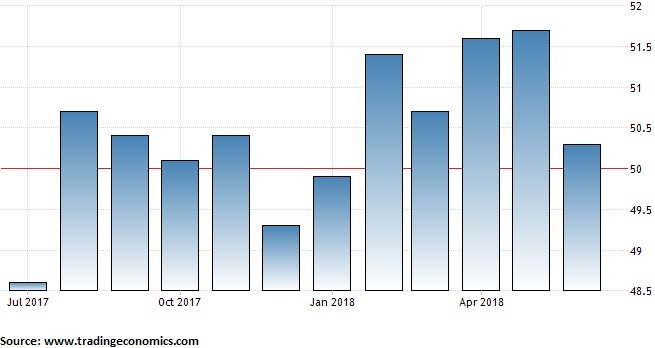 Aashna Dodhia, Economist at IHS Markit, commented on the latest data saying: "PMI data signaled that the improvement in operating conditions in June was the weakest since the start of the year, thereby highlighting a loss of momentum since May. This reflected slower expansions in output and new business. Another key finding was that input cost inflation moderated to the weakest since the start of 2018. Higher cost burdens were widely linked to currency weakness relative to the US dollar." He added that "latest data indicate that the recent interest rate hikes by Bank Indonesia to protect the rupiah appeared to have hindered consumption. This suggests it will be challenging for policy makers to ensure financial stability without compromising economic growth over the coming months. Notably, business sentiment eased to the weakest since October 2012 at the end of the second quarter."